In all it's decaled glory! Now to edit all the photos and write the instructions. Who has more fun on a holiday weekend than me? To the makers of CA. Do you think, maybe, perhaps, you could date the bottles of glue as you bottle them? CA does not keep forever. I'm not sure what the actual shelf life is, but it does indeed have a shelf life. 2 identical bottles, bought from different stores. The one on the right was opened 2 days ago. Thye one on the left just this morning. The one on the right provided CA that wouldn't cure without accelerator. The one on the left performed exactly as required. Rather annoying when trying to mount tanks onto underframes. It's also annoying to be tossing a virtually full bottle of glue. And it's off to the paint shop! The platform is done! And the last little details are on the model. Shortly it'll be deciding which shade of black to apply. The platform went together far quicker than I was worried it might. Which is always good news. Heavily aided by thoughtful design and valuable input from the team that helped get this project done. This project has been in the works now for almost 3 years. It has involved at least 8 different people in 3 countries on 2 continents. My deep gratitude to all who had a hand in this. The process of building pilot models is draining. Rewarding, but draining. After far too many delays and minor hiccups, this model is now reaching completion. And I couldn't be happier. So far the model has gone together pretty much as I had hoped. Still have to pause and consider how best to approach some of the tasks involved in assembling this car. As well as, I have to stop and write down all the steps as I go for the instructions, which slows down progress some. Tomorrow it's the etched dome platform. With any luck I'll be flinging paint before dinner. I fully expect to be able to have this model ready for sale at the St Louis RPM in August. Right now the intention is to only offer 50 kits for sale. If there's more demand I'll consider a further production run. 0.060" styrene sheet for backdrops and fascia. The plastic is relatively cheap. $100.00 bought me 4 sheets. It's real easy to work. Just scribe and snap like you would for model making. Admittedly 4'x8' sheets are a tad unwieldy, but we prevail. No fasteners are required. I use a panel adhesive, No More Nails, it grabs well and drys fairly quickly. Seams are dealt with by scabbing a splice plate on the back and gluing using solvent cement. In this case good ole Testors. I'll use spot putty to fill the seams and it'll get painted in a couple of days. I put up 40' of backdrop in a couple of hours, without assistance. It's starting to look like a model railroad down here. Roadbed takes a tad longer. Thought I'd reward myself a little after getting those MKT cars all done, so I got the roadbed in on the newest section of benchwork. I tossed some strips of plywood onto the framework and stared at it on and off for a couple of days, trying to determine what pleased my eye the most. In the end I settled on a very slight curve just east of the CPR diamond and then a nice long straight stretch to the corner. I'll come back now and determine where the culverts may go and start laying ties. Have to start really thinking hard about Aylmer soon. It's next. I have just finished building 4 of Southern Car & Foundry's O Scale MKT Single-Sheath Box Car Kit 303. One is for a client, but 3 are now for sale. These kits are yet another stunning example of the high quality work executed by Jon Cagle and his cohorts of pattern makers. Very nice castings with laser cut running boards, photo etched details and injection molded details where appropriate. These cars are being offered with San Juan Car Works scale trucks and Type E couplers. The cars have been moderately weathered and decaled using Protocraft decals created specifically for this kit. I'm asking $360.00 USD for each car, which includes shipping and insurance within North America. Contact me at pierre.oliver@elgincarshops.com if you're interested in acquiring one of these cars. I had a little time on my hands and an inclination. Always a dangerous mix. So I put up the benchwork that runs along behind the St Thomas yard. Took me about 2 hours to cobble all that together. At the far end of the room you can see where the stairs to the garage are and there will have to be a liftout section created there. But that's down the road some. The exterior wall to the right will be where the town of Aylmer will be located, with it's tobacco warehouses, feed mill, milk condensing plant, canning plant and the usual assorted receivers of rail traffic. Coal dealer, stock pens, team track, etc. The run on the newest bit of benchwork will be mainline only. 35' of glorious mainline. I plan to include a couple of culverts for visual variety and that'll be about it. The Redballs will photograph stunningly through here methinks. These scenes are the results of 7 passes, adding layers, colour and texture. There's still more to come. Right of way fencing, telegraph poles, and trees! Sculptamold applied over styrofoam, I don't tint the Sculptamold since it really messes with the setting time. Brush on slightly thinned Weldbond and sift in Woodland Scenics Burnt Grass as a base. Once that sets, randomly scatter 2-3 other greens of ground foam and spray with wet water and secure with thin white glue. Randomly add clumps of Scenic Express Coarse Super Turf, again with a variety of colours, secure with matt medium. Brush in a layer of slightly thinned Weldbond around the clumps and add a layer of static grass. I've added a swath of shorter grass about 1.5" wide between the Right of way and where the fencing would go. Suggesting proper maintenance. Once that has set, spray with unscented hairspray and lightly add blues, white, pink and yellow for wild flowers. I'm really liking the results so far. Now that I've painted the rail I can add the final ballast profile and get the final details in. There were six of those cars. They belonged to the Canadian National's Mexican subsidiary, CNdeM. Designed by August Ferdinand Möbius, they were unique in all of North America in having three sides. Side "A" was lettered CANADIAN NATIONAL of MEXICO, side "B", CANADIEN NATIONAL du MEXIQUE, and side "C", CANADIAN NATIONAL de MÉXICO. 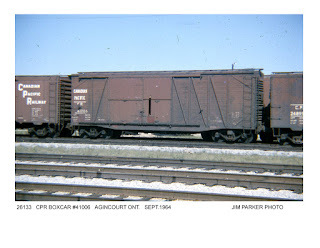 They were used in sealed, bonded service transporting brightly colored household goods from Mexico to Canada, and monochromatic outdoor furniture on the return trips. The service was terminated after a particularly tragic event, when several Canadian citizens, fleeing the oppressive ennui of their homeland in search of a new, if not flamboyant, at least less boring, life south of the border(s). died in a sealed boxcar that was inadvertently routed through Chicago. When the car was finally opened, their last, heartbreaking words were found written on one of the inside walls. Those words resonate to this day to citizens of our neighbor to the north seeking something better: "Beige is not a color!" The six cars were converted to Geometry cars. It's good to see that models will soon be available. There's no projected release date as yet. Many little things to do. Till then save your shekels. 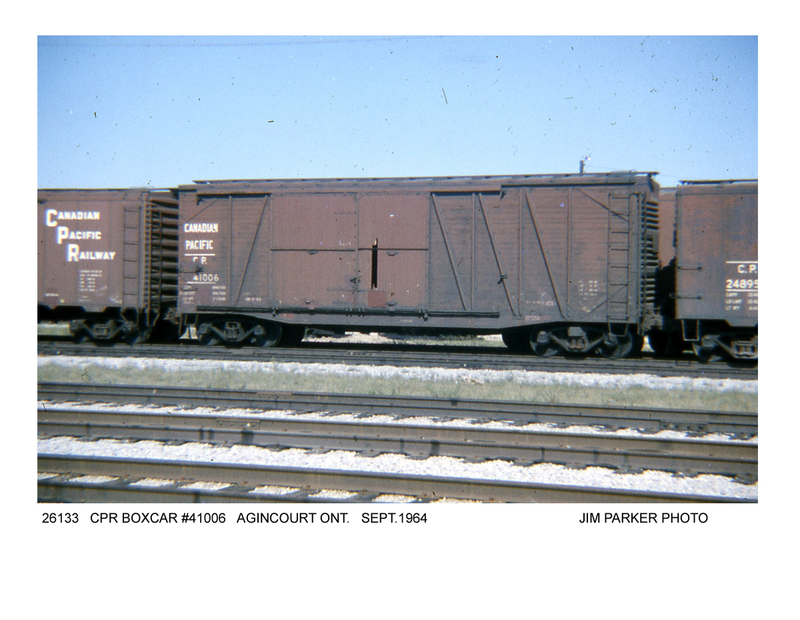 There will be many new freight car models coming within the next year. Well obviously it's a model of some kind of boxcar. But what road? What era? I can hear you now, "Details! We want details!". Well your going to have to wait. I like to tantalize some. Here's what I am prepared to tell you. What you see is the assembled parts of a car that we're working on. What makes this special is that all the parts you see were 3D printed. The resolution that was used for this first print is nowhere near fine enough for us to release this as a kit at this time. Particularly the roof. The print lines are very much in evidence. But for purposes of checking the CAD work, and other features it's quite adequate. We will be reprinting these parts in a far finer resolution for the final pattern and then resin casting the production run. This I believe is the way to go with current technology. If you're capable with the CAD software, very stunning patterns can be had. But there are still some detail parts that still need to done the old fashioned way. Things like upper door track covers, ladders, grabs,etc. I'm very excited about this project and am very much looking forward to getting it to market. I think it'll be a winner.